I was having a problem sending an email through outlook in one of the dev machines at work this morning. After reading a few articles about the topic, I eneded up going to the Component Services to edit the Outlook Message Attachment Service component. Component Services> Double click in Component Services > MyComputer> DCOM Config) I did not find the service I was looking for. In addition, I found a service called AX32 I wanted to test with and I right clicked and went to the Security tab and everything was grayed out. http://msdn.microsoft.com/en-us/library/ms678426(VS.85).aspx) saying that DCOMCNFG does work properly in Windows Server 2008 and Windows 7, but it doesn't. Anyway.... the solution to bad DcomCnfg behavior under 64 - bit Windows OS's is to use the 32 bit version of DcomCnfg. 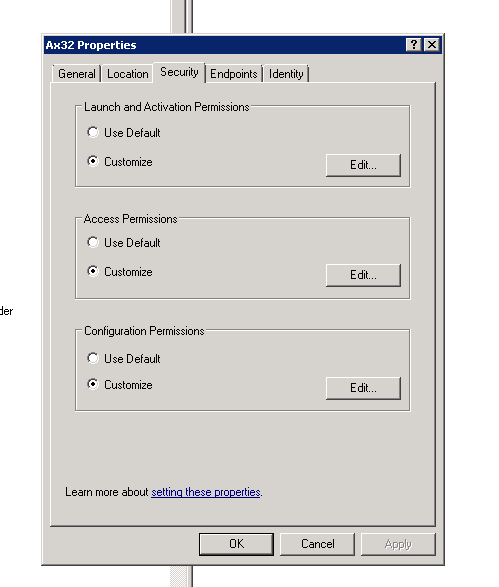 then the X component under DCOM Config -> properties -> location tab. All check boxes are available, and none are grey.